Hospira announced a voluntary recall of one lot of Magnesium Sulfate in Water for Injection (0.235mEq Mg/mL) 40mg/mL 2g total, 50mL. The recall is following a confirmed customer report of an incorrect barcode on the primary bag labeling. Magnesium Sulfate in Water for Injection is indicated for the prevention and control of seizures in preeclampsia and eclampsia. The affected product has a barcode identifying the product contents on both the overwrap and the primary container. The overwrap barcode is correct but there is potential for the primary container barcode to be mislabeled with Heparin Sodium 2000 USP Units/1000mL in 0.9% Sodium Chloride Injection. If the product is administered based on the printed name and the incorrect barcode, patient harm is unlikely since the barcode on the overwrap and readable text on the primary container and overwrap are correct. 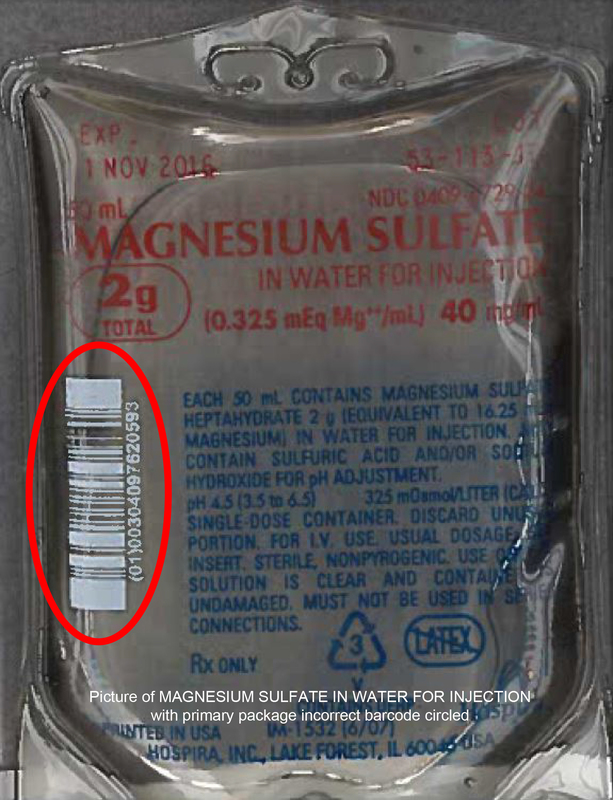 However, if the incorrect barcode is detected, there may be a delay in treatment with Magnesium Sulfate in Water for Injection that could lead to life-threatening seizures, stroke, cerebral hemorrhage, maternal death, and fetal risk. If Magnesium Sulfate in Water for Injection is administered to a patient who is prescribed heparin and in whom magnesium sulfate is contraindicated, it may lead to serious adverse events. Hospira noted a low likelihood of occurrence due to high detectability of this noncomformance. The recalled product is packaged in 50mL fill, in 100mL container bags and sold 24 bags per carton. It was distributed to wholesalers, distributors, and hospitals from September 2015 to November 2015. The Company is investigating the root cause and corrective and preventive actions. For more information (877) 650-7695 or visit FDA.gov.